Having finally arrived home after a long trip and a chance to sober my emotional thoughts, I felt it necessary to reflect upon the lessons learned and the experiences had on the CBF 2016 tour. It was incredible to have been able to experience the battlefields of wars fought decades ago. The impact of war has had long-standing consequences on the land and those that inhabit it. Something that will always stay with me is the warm welcome we received. Simply by brandishing the maple leaf, we inherited the title of liberators. Having felt that I did nothing to deserve this, I was especially astonished. I suppose remembrance and commemoration were always to be thankful for. The endless generosity and gratefulness of the people of France and Belgium will always be remembered. On a more personal level, the Canadian Battlefields Foundation gave me something that meant the world to me. They gave me the opportunity to learn to love my great grandfather, Valentine Solomon Crawford. I would have never taken the time to delve into the details of a man whose life is the reason I live today. 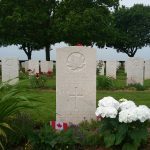 On June 10, at the Bretteville-sur-Laize cemetery, I approached his grave. I wasn’t prepared for the emotions I felt that day. Anger, sadness, pride, joy. Through tears, I revealed the details of his life. My endless love and admiration for this man had been realized in those precious moments I spent sitting in front of his grave. The tragedies of war had come to bear on me as I traced the letters engraved on his tombstone. I had spent the entirety of the trip reflecting on the perils of facing the enemy in combat and now I reflected upon the aftermath. “We miss him more each day. Friends know not the sorrow within our hearts concealed.” Fewer words had ever rang truer. Leaving him was one of the hardest things I have ever done, but I took solace in how peaceful his final resting place felt. He died so that others may live and that is the noblest of sacrifices. The passion of those involved in the tour made the information they imparted so much more fascinating. The connections I made and the knowledge I learned have strengthened my resolve to continue studying the trials of military conflict. I plan to impose this particular experience on my future academia. I am eternally thankful for being one of the few selected to participate in this year’s Canadian Battlefields Foundation Tour. It has been the experience of a lifetime and the memories made will be ones I will keep with me forever.